RevK®'s rants: Oh, no ADR for me! Well, I complained about the complaint handling process, which is something I can complain about according to the Comms Act, and I complained about the service, which is again something I can complain about, but this is what the Ombudsman service had to say! Shame they were not so dismissive when someone complained about A&A. 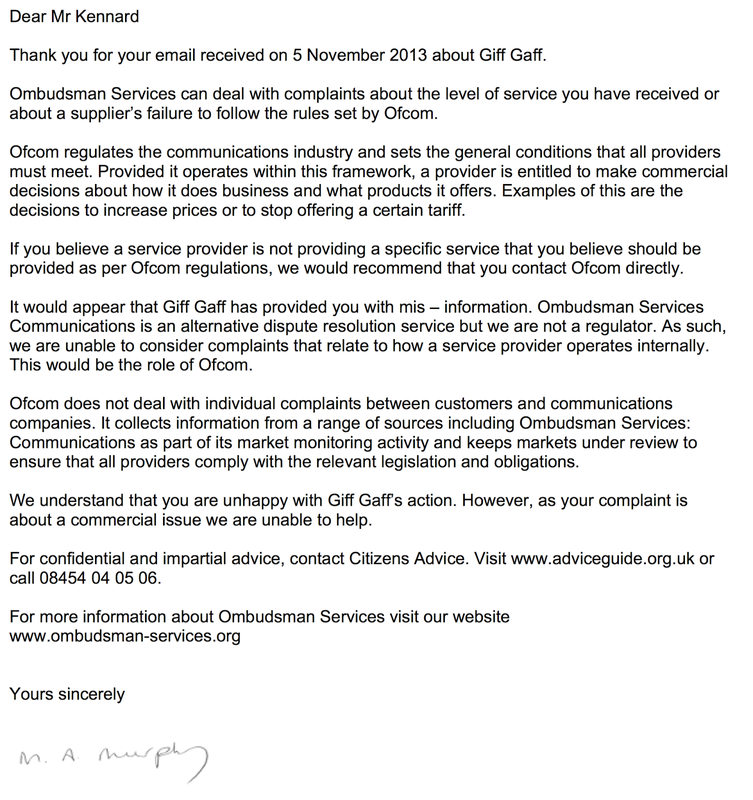 Giff Gaff is self evidentially "failing to follow the rules set by Ofcom"
The complaint is also quite clearly about the level of service received also, so the complaint quite obviously ticks both boxes described in the first paragraph. Further down they even say that GiffGaff have provided misinformation - a clear admission that they accept the complaint involves poor customer service. The upshot of the whole letter seems to be that there is little point in Ombudsman Services existing in the first place since (I would imagine) every single complaint they receive could be put down to decisions resulting from internal operations. So the whole letter says "We deal with suppliers failure to follow the rules set by Ofcom. But when a service isn't provided by Ofcom, contact Ofcom directly, except Ofcom won't deal with you...."
Paragraph 4 - We don't deal with complaints about how a "service provider operates internally". Ofcom does. Your letter seems to contradict itself. You say you *can* deal with complaints about the level of service received or a supplier's failure to follow rules set by OFCOM. Then, later, you say if I think a supplier is not following rules set by OFCOM I need to contact OFCOM. Then, later, you say OFCOM do not deal with issues between a customer and a provider. My complaint is two fold. 1. I am complaining that GiffGaff are refusing to provide ACR which has been requited by law for 10 years. This is a complaint about the service they offer, and as such, according to your first paragraph, something you can consider. 2. I am complaining about the way GiffGaff have handled my complaint, dismissing it, not actually addressing the issue, and then telling me that Offcom are their ADR provider, as well as refusing to acknowledge I have registered a complaint and refusing to provide a deadlock letter. All of these are issue that, according the Communications Act, and OFCOM GCs, you can handle. Are you refusing to take this case? Presumably this is how they address the apparent absurdities, that even pointless or downright vexatious complaints about an ISP can theoretically be taken to ADR, even from someone who isn't a customer: if the ADR provider just bounces complaints rather than considering them properly, that would seem to avoid the costs involved. Giffgaff's stonewalling has been quite disappointing to me (as a founder ex-customer), though perhaps not surprising. I'd love to hear Ofcom's take on their excuses, particularly "Ofcom are our ADR provider" and "the law only applies if we want it to". It's high time ACR were more widely available, and I'm quite sure O2 could enable it if they were minded to: it's just a question of pushing hard enough. Thank you for your letter of [x] November 2013. Having noted carefully the concerns raised by your response, I believe that I may not have enabled you to make a full and proper assessment of my complaint in my original email to you. As such, I provided further information below, which will, I hope, enable you to conclude both that the Ombudsman has jurisdiction to consider my complaint, and that my complaint falls within the limits imposed on the Ombudsman within its Terms of Reference. My complaint relates to the electronic communications service operated by Giff Gaff, namely the provision of mobile telephony services. This is a service which falls within the jurisdiction of Ombudsman Services: Communications. I am a domestic customer of Giff Gaff, with a contract for the provision of this service. The Ombudsman Services thus has jurisdiction over the complaint, by virtue of paragraphs 3 and 4 of Annex 1 to your Terms of Reference. Your terms of reference set out two preconditions for acceptance of a complaint. Firstly, that the complaint falls within section 9.1 and, secondly, that the complaint falls outside section 9.2. In terms of section 9.1, (a) I gave Giff Gaff notice of the matter which the subject of my complaint within 12 months of first knowing of the matter, (b) I have not received a deadlock letter within 8 weeks of giving notice, and (c) I have brought my complaint to you within nine months of the date of giving notice to Giff Gaff. As Giff Gaff provides a mobile telecommunications service, the question as to “whether” a service is to be provided does not arise: the service is provided, to many customers in the United Kingdom. Similarly, my complaint does not relate to the terms on which the service is provided: the terms of the service are not in dispute, as they are set out quite clearly on Giff Gaff’s website. Indeed, my complaint does not relate to “commercial judgement” (or, as set out in your letter, “a commercial issue” or “how [Giff Gaff] operates internally”), but rather to a particular failure to, as your letter puts it, “follow the rules”. On the basis that my complaint falls within section 9.1 and outside any of the grounds in section 9.2, I hope that you are able to conclude that my complaint satisfies the requirements for acceptance by the Ombudsman as set out in your Terms of Reference. Well written. Thanks. I've sent my terse reply already, but it probably would have been better like this. I'll try it if they don't do any better.